Paddleboarding is a sport that has increased in popularity over the years. This new favorite activity requires you to cart around a 10 foot board which for most people can prove quite challenging. When looking at inflatable boards, you need to find the best paddleboard bags to carry your board with ease. This will allow you to bring your activity with you just about anywhere you go. This board bag is lightweight and will protect your board in numerous ways. One of the ways in which it will protect your board is by keeping the UV rays out. The heat will not get into the bag and accumulate, damaging the board over time. The design of the bag has been kept simple, and the focus has been on high-quality materials which will protect your board. The material is not only heat-resistant, but it is also water-resistant. The carrying handle with this bag is padded for extra comfort, and there is also a carrying handle, should you want to give your shoulders a rest. This handle is also a welcome addition for moving your board in and out of storage or a vehicle. There is a 1/5” protective foam layer on each side to offer great protection to your board. There is also a durable zipper to let you in and out with ease, and the zipper is sand-resistant, so you will never find that your zip sticks over time. There is a 100% satisfaction guarantee. You can use your board bag for 30 days, and if during that time, you are not completely satisfied, then you can get your money back with no questions asked. The company stands by their design of this bag, and the bag should offer you enough protection that you will not take them up on that offer. 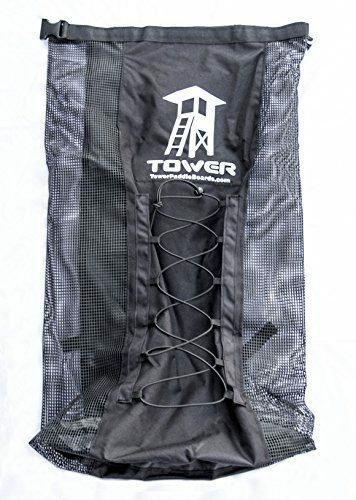 The Tower iSUP paddle board bag is designed to fit the Tower Adventurer 9’10” board. With that being said, it can fit boards around the same size. 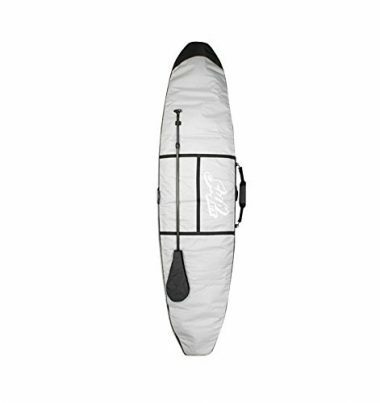 Features that include a velcro and snap top closure, interior zipper for your fin and a bungee system on the front make this an exceptionally well rounded stand up paddle board bag. You will not only be able to carry your board, pump, and paddle, but also a towel and cell phone. This is a very versatile SUP paddle board bag. This bag has been designed to be durable and spacious. The original design has come from an avid paddle boarder and has been crafted to fit any inflatable paddleboard. The generous amount of room eve takes the pump into account, and you can roll up your paddleboard around your pump and still store it in this bag. 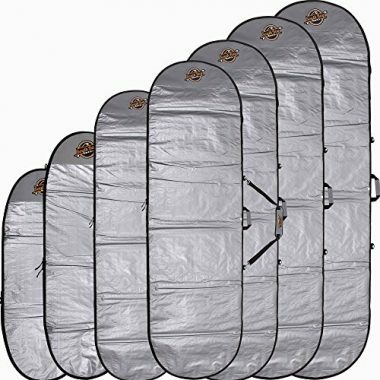 The mesh panels are also designed to help dry out your paddleboard when it is in storage. The clever thing about this bag is the included handles and the ways in which you can pick up your bag. There are four separate handles on this bag, including some on the sides and some on the top. The handles give you options when you are lifting the bag, and are especially handy when you are picking up your bag from an airport carousel. When your bag comes round, the chances are that the handle will not be at the top of the bag waiting for you. The difference with this bag is that no matter how the bag comes out, the handle will be there waiting for you. There is also a large padded shoulder pad to make carrying easy and comfortable. The adjustable strap lets you spread the weight of the bag evenly, making the carrying more comfortable still. There is also a padded layer between the board and your back, creating even more comfort. There is a velcro paddle pocket on the other side of the bag so you can safely store your paddle without it being in the way. The SUP ATX Deluxe Paddle board Bag is an excellent option. Durable material encase the nose and tail of your board ensuring no damage occurs when storing or transporting. A large shoulder strap will allow you to carry your board hands free while a special attachment for your paddle ensures you only need to make one trip to launch your board. A white material helps keep the harsh sun from heating your board and four pads on the base make sure your board doesn’t get dinged while it’s on the ground while you get ready. BIC has many years of experience in designing watersports and their knowledge has created this paddle board bag. The BIC Sport board bag is an excellent way to transport and store your board. Features like a durable 600D material, 5 mm foam, and a heat resistant reflective deck all work to protect your board from not only the elements, but also dings and dents. Coming in many sizes ranging from 9’6” to 12’6” this board bag is sure to fit your paddle board. 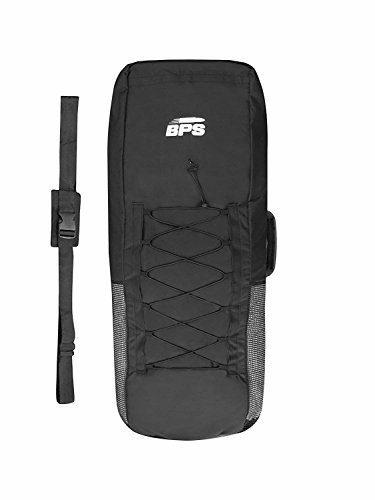 This board bag offers you the best protection while remaining lightweight and easy to use. When you first feel the weight of this bag, you will be unsure if it can offer the protection you need, but when you feel the quality of the foam, you will know that your board will be safe. The board bag is heavily padded to offer your board the protection it needs. This is a great bag for your more expensive boards. 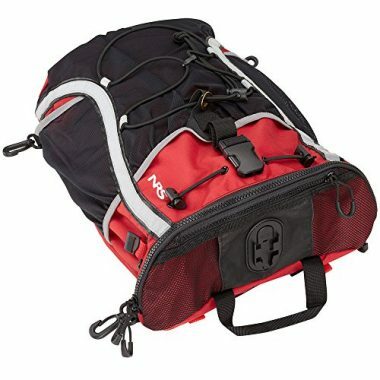 It is also a great bag if you want to take your bag on a plane, and don’t want to worry about your board being damaged. There is a large exterior pocket to keep your paddle safe, and large interior pockets to keep all of your paddleboarding accessories safe too. The large interior pockets also have drainage, so that you can put your accessories in wet, and the water can still drain out. There is also a velcro fin slot, so you do not need to worry about taking your fin off, or your fin being damaged when it is in the bag. There are also interior straps to secure your board, and a luggage tag if you do want to do some traveling with your board bag. The zipper is large and non-corrosive. The fact that it is non-corrosive means that it will not rust and get stuck. With the zipper being large it is easier to grip onto and easier to open than a smaller zip. The bag is also heavy-duty and durable, and you can store this bag outside for long periods of time, and still have it protect the board within. Wear it as a backpack or roll it on its heavy duty wheels, either way you will love this sup board bag. We have all wrestled to get a bag to close but you won’t have to worry about that with this bag. 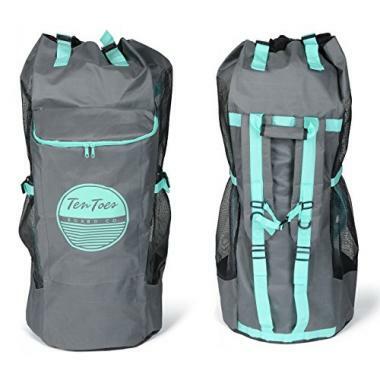 Its spacious and well planned design makes it so that you can easily fit almost any sized paddle board, paddle, paddle board leash and paddle board accessories. 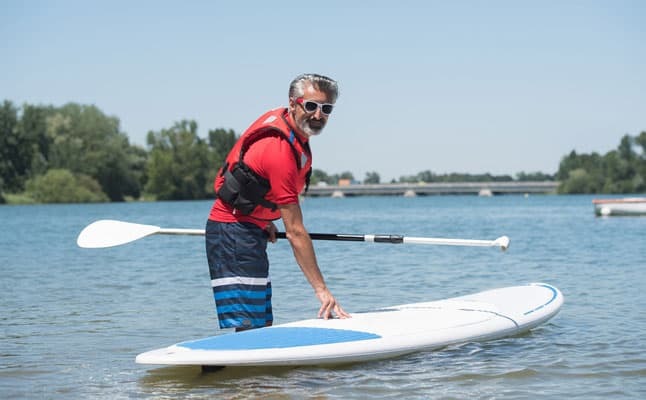 Travel with ease with this wheeled paddle board bag as it is able to get checked as regular sized luggage with most airlines and has enough space to fit extras. This sleeve is easy to use and will protect your board when it is in storage or transit. The sleeve is made from durable 600D polyester and nylon. These two materials combine to give you great protection from the elements. The materials are also heat and water-resistant. This is important for keeping your boards protected. If the heat gets into the sleeve, it can build up and begin to damage your board. The same is true for water. If water gets in or heat gets in, the moisture can build up in both cases. When moisture sits on your board for long periods of time, it can cause damage. It can also damage a sleeve. This sleeve stops that from happening. The 1/4 niche foam at the nose and bottom help to protect the most vulnerable parts of your board. The tail and the nose are the parts which take the brunt of the damage when knocked against a hard surface. The easy entry zipper makes this an easy sleeve to get on and off your board, and there is also a zippered fin slot. This lets you seal the bag if you want to take your fin off and use the bag without a slot. There are also compression straps to help secure your board in the sleeve. This is an extremely heavy duty stand up paddleboard bag. From its heavy foam protection and shock absorption qualities to its waterproof design, this bag is sure to keep your gear safe. Has a safe separate area for your paddle with a paddle blade cover. Separate storage space for your fin. Extra thought went into designing durable buckles to keep your carrying straps secured over time. This backpack is specially constructed for your inflatable paddleboard. The outer shell is made from 400-denier nylon, which gives great protection to your paddleboard and will also hold up very well to abrasions and knocks. The bag may take knocks, but it will be hard to puncture this board. There is also an inner bag which is made from high-quality urethane. The inner bag has a HydroLock zip-seal closure, which means that this inner bag is waterproof, and perfect for protecting your board inside. There is a zippered mesh pocket. You can put your valuables in there and have them secured and visible. There are also three expanding mesh pockets for you other paddleboard accessories. These pockets can safely hold a small amount of cargo without the cargo being loose, but if you want to add a lot of cargo, then the pockets will expand to accommodate that. There are hook and look attachment straps on this bag, so you can attach additional things to the bag or attach the bag to something else. There is a carry handle if you do not want to carry the bag on your back, and reflective tape to add some visibility to your bag. This deck bag is also very handy for your trips out in the water, and the multitude of pockets make the bag great for storing and organizing everything you need for your trip. You are going to want a heavy duty and lightweight bag. Either coming in a backpack or shoulder sling style these SUP bags will make it easy to get to the beach. You spent a lot of money on your paddleboard, having the best travel sup bag is important so that you can protect it. Sizing is also something to look for in a paddle board bag. Being able to store everything you need such as your, paddleboard, paddle and all your accessories will ensure an easy trip to the beach. Look for a bag that is able to be quickly and easily loaded and unload nobody wants to struggle, especially on the perfect day. When you are looking at a board bag for transporting your bag, you should also be looking at a bag for storage. In fact, you should be looking for a bag which can either do both or has a good compromise between the two. 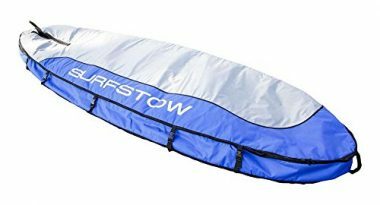 Inflatable boards will use a different bag for hardboards as you will not want to keep your inflatable board inflated when it is in storage. 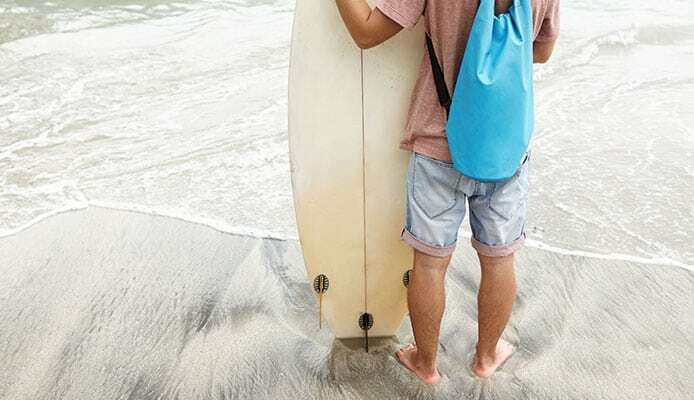 Inflatable boards may come with their own storage and travel bag, but if they do not, then a backpack-style bag is the way to go. Look for a bag which distributes the weight evenly and has comfortable shoulder straps. You should also be looking for a bag which has a hard bottom for storing in your garage. With a hardboard bag, you want to look for a bag which has a comfortable shoulder strap, and also lots of padding for when it is in storage. Look for bags which are going to protect your board when they are in storage and in transit. The foam lining in your board bag is important for protecting your boards. When your boards are in transit, they can be bumped and shunted. Even when you are carrying your board from your vehicle to the beach, you can accidentally hit your board on a rock or another hard surface. The farm lining in your board bag will protect your bag from any harm. When you are looking for a good foam lining, be prepared to look for some compromise. A lot of foam will give better protection to your board, but will also be heavier and more cumbersome. A small amount of foam will be lightweight and more compact, but will not protect your board as well. Less foam will also mean that the board bag will cost less. When you are choosing your bag, try to find a compromise between the price, the amount of foam, and the weight of the bag. We would recommend more foam if you can afford it and can carry it. The size of your board will determine the size of the bag which you need. You should know the size of your board, and you should also recognize that not all boards are the same size and shape. For example, yoga boards will be wider to give you more room to move about on. If you have a wide board, then you need to find a wider board bag. Most board bags will accommodate a variety of lengths, but the width can be tricky. You want a bag which will not be stretched or strained when your board is in it. It is better to have a little too much room than not have enough. Too much room can have your board sliding about too much, but too little can break your bag. Try to find a bag in which your board can fit perfectly, but if you cannot, then look for one which has a little more room. You are going to be out in the sun when you are paddleboarding. Your bag is going to be in the sun, and the board is going to be in there for periods of time, when it is being transported on your car roof rack, and when you are transporting it to the water. You use sunscreen to protect your skin, and you should also try to protect your board from the heat too. Board bags with no reflective layers will only store the heat in the bag, and this can be damaging to your board. Look for a layer of sun protection on the exterior. Some bags will have a silver layer to reflect the heat away from the bag and keep the interior of the bag cool. If you want to go the extra mile, then you can also wrap your bag in a protective lining to keep the heat away from the board. Pockets are useful for keeping a hold of your other accessories, and also for holding fins when they have been removed from your board. Ensure that you find pockets which are big enough for the fins and any other accessories which you want to carry. When you are carrying your board, you will need to take the fins into consideration. If the fins can be removed, then you can take them off and place them in a separate storage pouch. If you have fins which cannot be removed, then you have to work around that issue. You also need to take into account the number of fins. Boards will either have one fin or three. No matter the number of fins, the bag you purchase must be able to accommodate all of the fins. Look for a bag with a fin slot (or fin slots). These slots will allow you to poke the fins through the slot and keep them from being squashed in the bag. They also help to see at a glance where the fins are and stop them from being damaged when they are in transit. Q: Why Use A Deck Bag On Your Paddle Board? A: When you are out on your paddleboard, you are going to want to store additional accessories, items, and food. Even when you are on the shortest trip, a deck bag can give you the storage options which you need, but the real value is when your trips are longer. 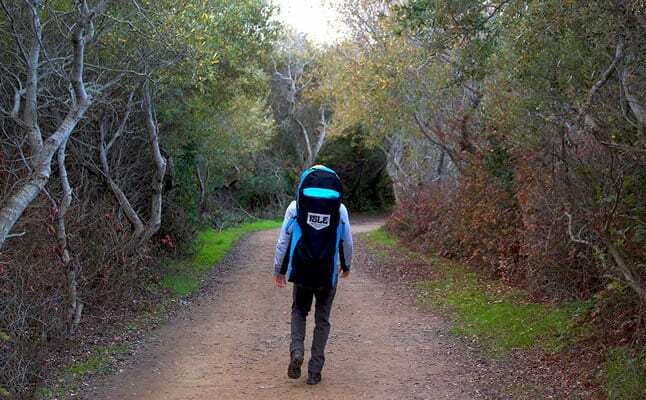 You can always take a backpack with you, but you will soon find that your shoulders get tired, especially if you are paddling too. With a dry bag, you get a waterproof bag, but you do not get the separate compartments. A deck bag gives you a place to store and organize all of your accessories, and do so in an organized way. They can be easily attached to your board with a velcro strap or to your d-rings. 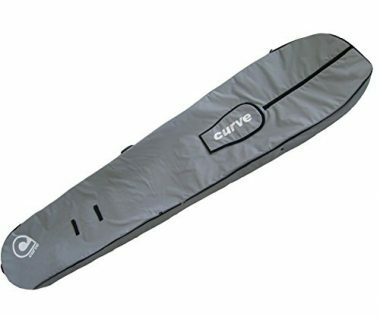 Q: Does An SUP Board Bag Have To Match The Length Of A Board? A: If it does match the length of your board, then you can get a better fit and more protection. A bag which fits well will stop the board from moving inside the bag and getting damaged. You should keep in mind that when manufacturers make their bags, they do so with a little bit of extra room, so a board bag which fits your board will have a little extra room. If you get a bag which is too small, then the board will shift in the bag and can be damaged as it bumps against hard objects. They also shift when you are transporting them on your person, and that shift in weight can cause you to lose your balance, and run the risk of damaging the board more. Q: Are Board Bags Are Designed To Prevent Heat From Building Up? A: Not all board bags are designed to prevent heat from getting in, but many are. We would always recommend buying a bag which reflects the heat from the bag. If too much heat gets in, it will be stored in the bag and can create moisture. While your board is waterproof, you want to keep it as dry as possible. If the moisture is kept in the bag for a long time, then it can damage the bag and your board. Look for bags which have a reflective layer to keep the heat out, and ones which have UV protection too. Q: Is It Okay To Keep My SUP In Its Bag On The Beach All Day? A: No. We would never recommend keeping your board in the bag on the beach all day. The heat will eventually build up and can damage your board. You should not keep your board in the sun for too long, but not in the bag either. We would recommend letting your board out of the bag but keeping it covered. Q: Do Board Bags Have A Fin Slot For A Board’s Box Fin? A: Not all board bags have a fin slot. If your board has a fin which cannot be removed, then you need to look for one which does. If you buy a bag without a fin slot, and your board has a permanent fin, then you are likely going to damage it. Thankfully, you can find a bag with fin slots relatively easily. A sup bag is an excellent way to not only transport your paddleboard, but also to safely store your board. All of the board bags on our list are made of high quality materials and will protect your board when you’re not using it. You paid hundreds, even thousands of dollars for your board so protecting it and bringing it with you is very important. These sup carrying bags will make it so that you can transport your sport with you, no matter where you go. Have a sup bag on our list? Let us know how it performs for you in the comment section below.